The following history was found at the Old Campbell County Historical Society, date and author unknown. Life in the late 1800s was one of simplicity and struggle for mere existence for the black people. This struggle was felt in all areas of living – socially, emotionally, educationally, financially and spiritually. Yet, our fore-parents and relatives moved dreams to realities in their struggle for the establishment of a place to worship and exercise religious freedoms. The place established was a Bush-Arbor, the cutting of canes to form a tent and putting chopped tree limbs around the tent to form the walls. According to the late Mrs. Nellie Tanner, there were two Arbors. The first one was located on the Tanner’s property; the second one was located near the present site of the old church at Rivertown and Rico Roads, possibly on the Cochran’s Place. Religion was a main source of inspiration and guidance for the black people during the Bush-Arbor Days. Therefore much though was given to building a church as the Arbor Day vanished. It was extremely difficult to build a church because our people didn’t have much money. They didn’t have financial resources but, they were rich in prayer and faith. Their work as farmers and sharecroppers had made them a people not afraid of work, for it would be this ability to believe and work that would later bring them the reality of a House of the Lord. During the late 1800s land was expensive. The cost was eighteen dollars ($18.00) per acre. This amount was more than our fore-parents and relatives could afford. Finally, they worked and saved enough to acquire almost two acres of land and build the first wood constructed church for the Rivertown community. According to our older members, the foundation was made of logs hued out with an ax, with most of all materials donated by friends and neighbors. The name of the first church was Pleasant Hill Methodist Church. 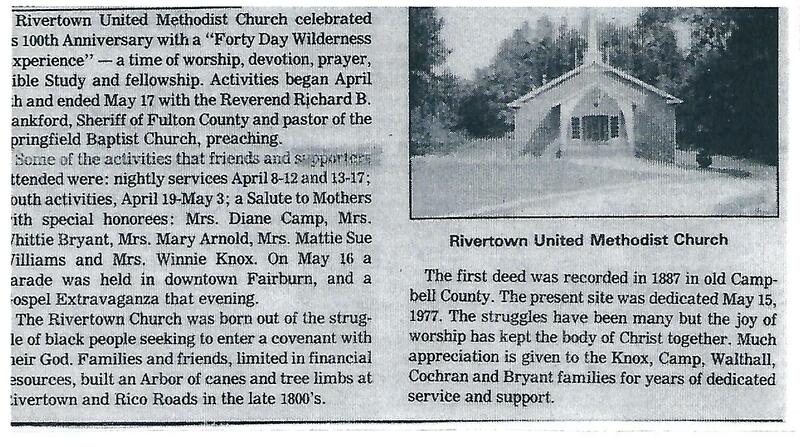 Years later the name was changed to the Rivertown Methodist Church. In 1917, Rivertown, Joes Hill and Bethel Methodist made up one circuit. Years later Rivertown, Joes Hill and Harris Chapel were on the Palmetto Parish. With the merger of the Methodist Church and the Evangelical United Brethren Church in 1968 ALL black conferences transferred from the Central Jurisdiction into the Regional jurisdictions in 1974. 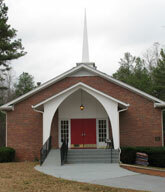 The name was changed to Rivertown United Methodist Church, located in the Atlanta-College Park District, of the North Georgia Conference. In 1977 Rivertown was blessed with the assignment as a stationary church with the Reverend Wimbley Hale, Jr., acting as a lay pastor. During the tenure of Reverend Hale the Rivertown Family moved in the direction of independence and acquired three acres of land at a cost of thirty-three hundred dollars ($3,300.00) from the late husband of Mrs. Rosetta Knox – Mr. Henry Knox. Reverend Wimbley Hale, Jr. led the people to build a new church with groundbreaking on the fourth Sunday in October, 1976. The Fairburn Hardware and Supply contracted to build the church under the supervision of Barker and Cunningham Architects, Atlanta, Georgia. The members said good-bye to the old church and entered the new one May 15, 1977. 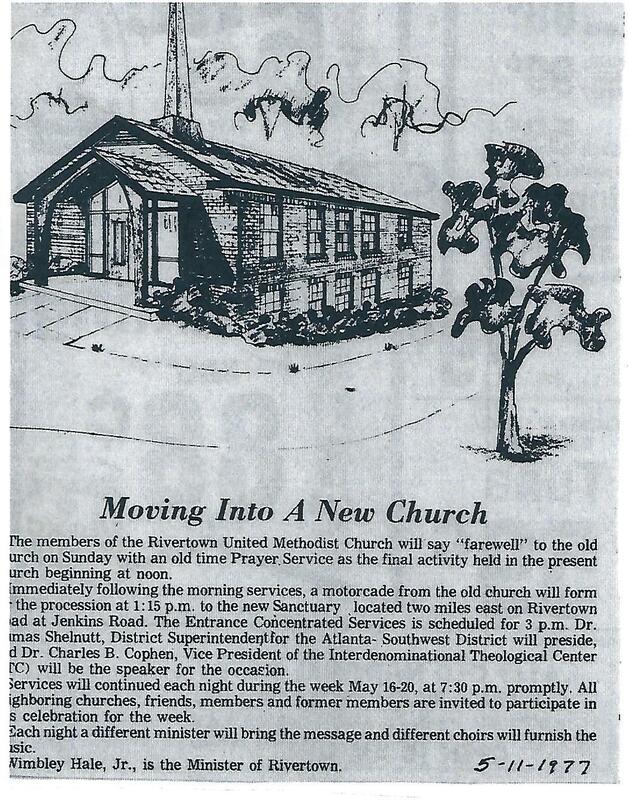 In 1984 Rivertown accepted the first woman pastor Reverend Patricia Perry Pace. With Reverend Pace’s leadership on May 15, 1988 exactly 11 years to date (May 15, 1977), we burned our church mortgage.